Under new rules endorsed by President Obama, US law enforcement will be banned from using some military equipment, such as tracked vehicles, grenade launchers, bayonets, heavy machine guns and most camouflage uniforms. The working group was established in the aftermath of events in Ferguson, Missouri, after local and state police reacted to protests over the death of Michael Brown, an unarmed African-American, by deploying military-grade gear. @rdevro@PaulSzoldra Double basic loads, 10 inch upper barrels for CQB, flashbangs, Advanced gasmasks 4 asslting, armored MRAPS. WTF?! At that time, it was difficult to distinguish photos of police in Ferguson from images coming out of war zones like Iraq and Afghanistan. Armored vehicles, manned by officers dressed in full camouflage battle uniforms and carrying assault rifles, cruised the streets armed with heavy machine guns. Local police in the US came into possession of tanks, bayonets and military armor though a combination of giveaways by the Pentagon, “war on terror” subsidies by Homeland Security, a surge in military veterans getting jobs in law enforcement, and private contractors advertising powerful armor and weapons. One source of military-grade gear is the Defense Logistics Agency’s (DLA) 1033 Program, which has transferred $5.1 billion worth of equipment to state and local law enforcement agencies since 1997. Actual military equipment amounted to $1.4 billion of that, distributed in 203,000 transfers to about 7,500 agencies, according to The Marshall Project. Under 1033, the Pentagon provided local sheriffs and police departments with armored personnel carriers (APC), assault rifles, military-grade body armor and uniforms, grenade launchers, and yes, bayonets. Deliveries have also included up-armored Humvees (High Mobility Multipurpose Wheeled Vehicle) and MRAPs (Mine-Resistant Ambush Protected), helicopters and aircraft. However, deliveries made under Program 1033 pale in comparison to the $41 billion in equipment issued by the Department of Homeland Security since 2002. Though the gear thus provided is earmarked for “counterterrorism,” DHS guidelines say it “can be used for any other law-enforcement purpose, from shutting down protests to serving warrants and executing home searches,” according to Mother Jones magazine. 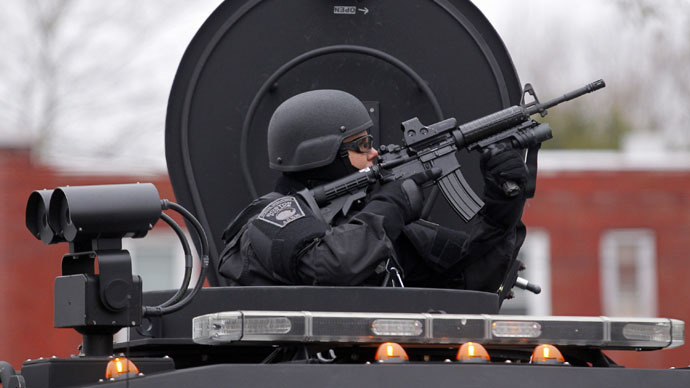 The 67 officers in the police department of Johnston, Rhode Island, population 29,000, for example, acquired "two bomb disposal robots, 10 tactical trucks, 35 assault rifles, more than 100 infrared gun sights and two pairs of footwear designed to protect against explosive mines,” The Marshall Project documented. - Latvia (2.1 million) had 8 APCs and 6 helicopters. Since 2007, Homeland Security and private corporations have sponsored weapons and gear expos such as “Urban Shield,” showcasing the latest lethal toys available for law enforcement purchase. Under the new White House rules, some of this gear is now off-limits, and some will require permits and reports. Among the items the equipment work group recommended proscribing from law enforcement are tracked armored personnel carriers (APC) such as the M113; heavy machine guns of .50 caliber or higher; bayonets of every kind; and grenade launchers. Some camouflage uniforms were banned as well, though exemptions were made for solid color uniforms, and woodland and desert camouflage patterns. The recommendations, accepted by the White House, ban tracked APCs, but say nothing about the wheeled ones – such as the popular Bearcat, whose “affordability, low maintenance expenses, ease of use and superior armor level” makes it “increasingly the replacement vehicle of choice for up-armored Humvees,” according to its manufacturer, Lenco Industries. The Bearcat, such as this one used by the Sheriff’s department of Johnson County, Kansas, boasts an “all mil-spec steel construction” and armor designed to transport a 10-man tactical team and protect them from armor-penetrating 7.62 rifle ammunition and .50 caliber machine gun fire. Vehicles such as the Bearcat and MRAPs are on the “controlled” list now, meaning that local law enforcement agencies will have to justify their purchases to federal authorities. Use of military-grade assault rifles has not been categorically banned, either. It is hard to speculate whether the new policy will begin to change the mindset of police who, as of late, often appear to treat the very civilians they are sworn to “protect and to serve” as the enemy.